The K-500 is 130cm tall and the smallest upright that Kawai makes in Hamamatsu, Japan. 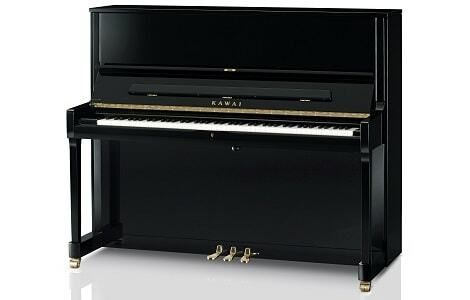 It benefits from Kawai’s precise and responsive ABS Carbon Millennium III action and longer keys than you would normally find on a piano of this type, offering greater levels of control and a better overall feel. Kawai have carefully engineered a level of structural rigidity that ensures clarity of tone across the keyboard, using strong back posts and a very stable aluminium action rail. This combines with a depth and flexibility of sound provided by the tapered, solid spruce soundboard to make the K-500 a rewarding playing experience. It is ideal for more advanced players who are unable to accommodate a grand piano, but this responsive instrument is also inspiring for those at an earlier stage in their piano playing journey. Players who wish to enjoy such a rewarding acoustic instrument, but also require the private practicing facilities offered by a digital piano will find the ATX-2 version of the K-500, with the Anytime X2 silent system ideal (RRP £10,333). There is also a new AURES version which adds a brilliantly flexible soundboard speaker system to the ATX-3 specification (RRP £10,888).